Inspired by their own backgrounds and those of their peers, students in Georgetown University School of Medicine have created a supportive and welcoming community for first-generation students. Members of the club, including its founders, are pictured at their inaugural event, a Mentor-Mentee dinner. (September 7, 2018) — Being a first-generation medical student can compound the feelings of self-doubt and anxiety that many medical students experience. However, participating in a new club at Georgetown University School of Medicine (GUSOM) has given first-generation students a sense of belonging and acceptance. 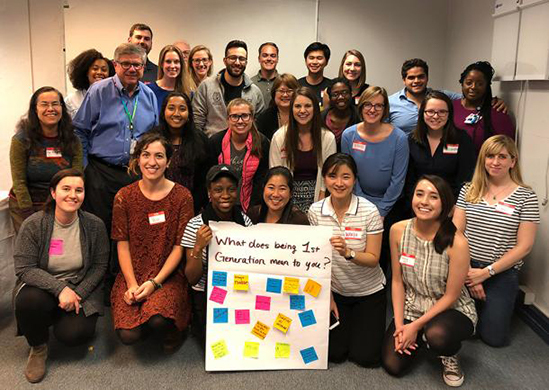 The Council on Diversity Affairs (CODA) created GUSOM Generation I to offer first-generation medical students a supportive and understanding network of peers and mentors, as well as a safe space to discuss their unique challenges. GUSOM Generation I intentionally defines “first generation” broadly. Whether they’re first-generation college graduates, first-generation graduates of colleges based in the U.S., or those who are the first in their families to attend medical school, all medical students who identify as first-generation are welcome. While college advisers and family members are often supportive and encouraging towards medical school applicants, some first-generation students have had different experiences. Being discouraged by a college adviser was an experience that stuck with Hailey Roumimper (M’21), even after she was accepted at GUSOM, making her feel like she didn’t fit in. “So much of the application process just to get into medical school feels like an erasure of your individual identify, a careful grooming and selection of what parts of you make the most desirable applicant,” Roumimper said, adding that this phenomenon often continues into medical school. Being the subject of teasing by family members can also make first-generation medical students feel like they don’t belong. 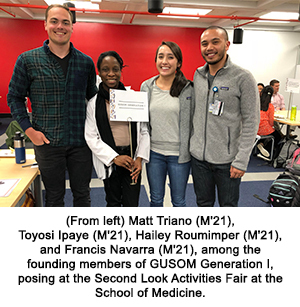 Matt Triano (M’21), the first member of his family to obtain a bachelor’s degree and the first to attend medical school, explained that while he feels supported by his family, they also sometimes “shame” him for his success. 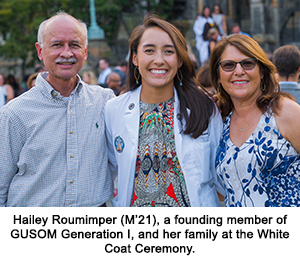 Similarly, some first-generation students said that watching their peers get “coated” at the White Coat ceremony by family members who are physicians made them feel out of place. “Because there were so many people there who have doctors in their families, I felt like an imposter,” said Francis Navarra (M’21), a first-generation Filipino-American student. Before first-generation students even get accepted to medical school, they can face “unforeseen challenges,” according to Toyosi Ipaye (M’21), a GUSOM Generation I member who is the first in her family to attend medical school outside of Nigeria, where she was born. For example, not having personal connections with medical professionals can make it difficult to find doctors to shadow. Without support from often-overbooked college advisers, first-generation students can struggle to prepare for the MCAT and complete the complex medical school application process. Connecting with other first-generation medical students felt like a “wake-up call” for Triano, helping him realize that others were dealing with the same issues he faced. “Something that we all discovered is that there is a sort of ignorance to being a first-gen student, like you don’t realize the difficulties you’re experiencing, until someone points them out to you,” he said. While they may share similar anxieties about attending medical school, many of them were not initially aware that they had peers who felt the same until they met through the club. Having been one of the first people in her family to graduate from a four-year U.S. college and to attend medical school, Wooju Kim (M’21) felt relieved to learn that a group like GUSOM Generation I existed. “I felt so validated,” said Kim, who is one of the group’s founders. Because of the many academic and social discrepancies that exist between first-generation medical students and their peers, Triano believed it was important for GUSOM Generation I to have a mentorship component. In fact, the club’s official launch event in April was also the kick-off dinner for the mentorship program. Triano and other members of GUSOM Generation I hope that the mentoring relationships will extend beyond graduation. Roumimper has personally found the mentorship component of the group to be extremely valuable. Her mentor, Kacie Saulters, MD, takes time to meet with her a few times a semester. “I feel like I can go to her with any questions or worries I may have, and it’s nice to have that support,” Roumimper said. Most GUSOM Generation I mentors are M4s and physicians who were first-generation students themselves or who empathize with the first-generation students’ experiences. GUSOM Generation I members strongly encourage any interested faculty and staff members to consider becoming a mentor. 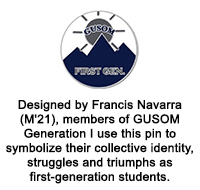 Following the club’s launch, GUSOM Generation I members created a recognizable way for first-generation students to bond with one another by designing a pin that would be given to all graduating first-generation medical students. The mountains on the pin represent the barriers that first-generation students face, the varying peaks illustrate the uniqueness of their journeys, and the sun is a reminder to never lose hope. Finally, the mountain’s summit symbolizes their ultimate goal: becoming a physician. The purpose of the pins is to make the group and their collective experience known to the entire Georgetown community. “That way whenever a physician walks by and sees it, for example, they’ll recognize our backgrounds and be aware of the diversity we bring here,” said Navarra. Email gusomgeneration1@gmail.com if you are interested in joining or becoming a mentor for GUSOM Generation I.